One of the great advantages of working from home is lunchtime. When I worked away from home, I was a horrible lunch packer. Either I’d forget, be too lazy, or nothing would sound good when I needed to pack my lunch. Often I’d grab something from the local sub shop or make a quick run to get a salad. I tried leftovers and occasionally that would work, but for the most part, my lunches were awful. Now that I’m home, I still set aside an hour for lunch but instead of heading out to grab something, I have an arsenal of lunches that are quick to throw together. Salads, sandwiches, pita pizza, leftover rice bowls, and toast. All meals only take 10-20 minutes to come together and are way more satisfying than the subs I use to eat. This meal in particular is great- quick to prepare but packs a punch of flavor. 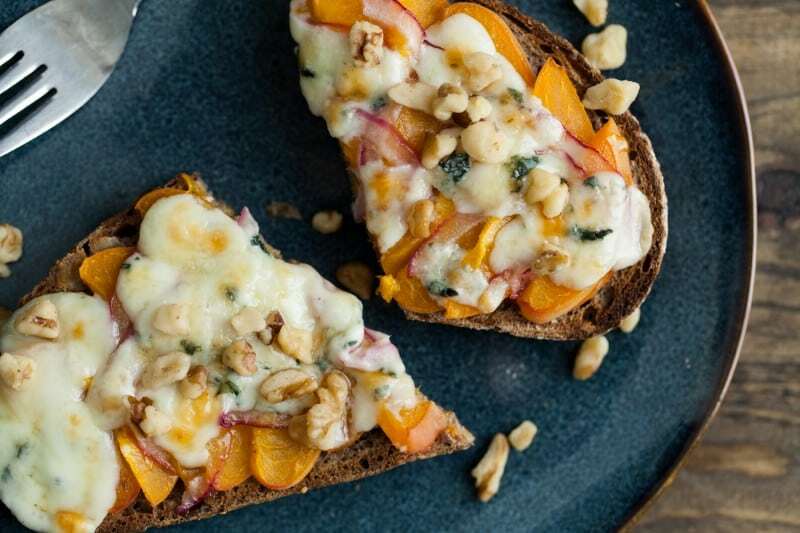 The apricots can be subbed out for peaches or nectarines and the blue cheese could be replaced with goat or even mozzarella for a mild flavor. Preheat broiler. Place pieces of bread on a baking tray and brush 1/2 tablespoon olive oil on each side. Place under broiler and lightly toast, watching carefully not to burn. Remove from oven. 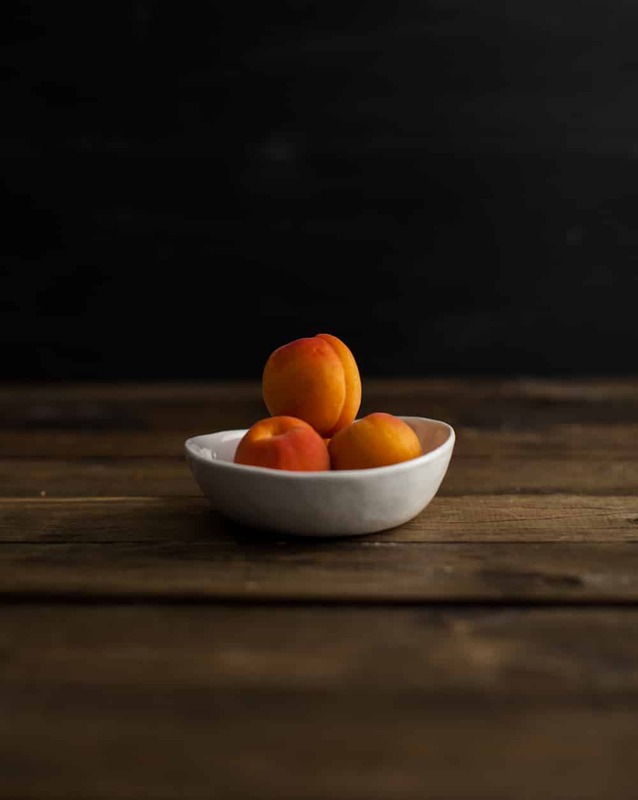 Cut apricot in half and slice into 1/4″ slices. Layer onto toast. 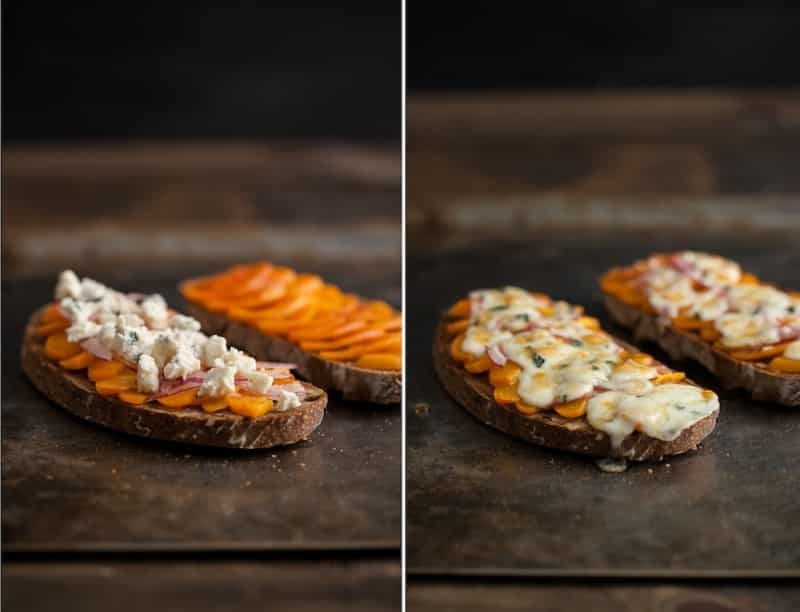 Sprinkle red onion over apricots, followed by blue cheese. Return tray to under the broiler and toast until cheese is melting and slightly browning, 30 seconds to 2 minutes depending on heat of broiler. 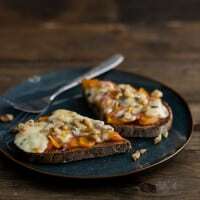 Remove and serve with a drizzle of honey and sprinkle of toasted walnuts. I’m pretty good about packing lunched to take with me to work, but the ability to heat things in an oven is probably the biggest downside. In my daydreams, I work from home and spend an hour making and eating both breakfast and lunch…. This looks perfect–simple, fresh, delicious! 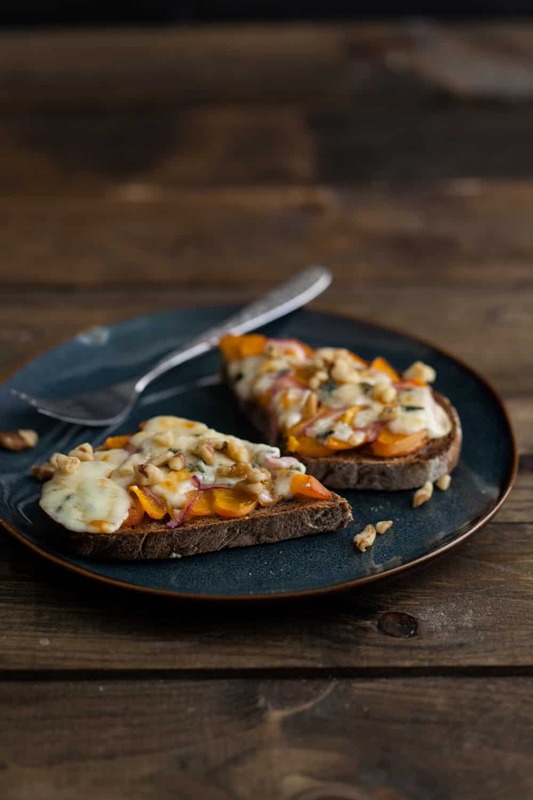 I’ve got so lazy about having proper lunches – this is such a good inspiration for the days when I’m at home. oh my, what a wonderful combination. 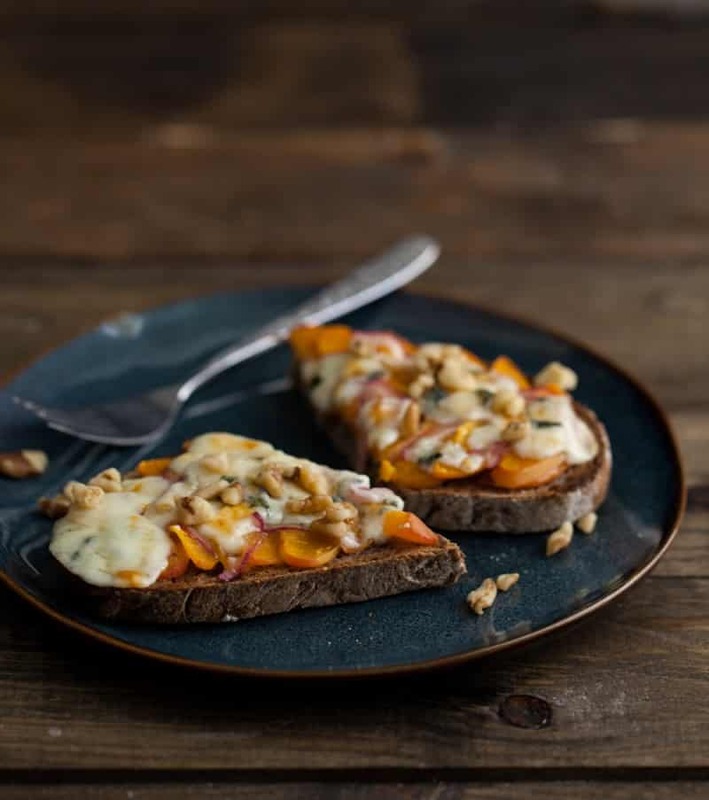 I love the brown bread and apricot combo – add walnut and cheese and you have a feast! oh my that bread looks unreal! (as does the sandwhich :)) does the bread have walnuts in it? Yes, it does! It’s a whole wheat/walnut bread from a local bakery! I’m pretty good at packing my lunches but thankfully I live across the street from where I work so in any event I can run home and whip something up! 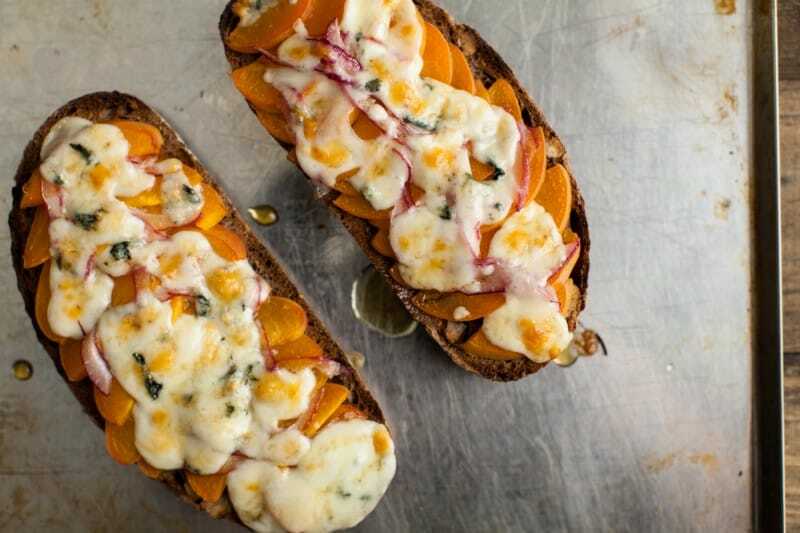 These tartines might have to happen. I love the picture progression. At the first picture I was like..mmm looks good. And then I saw further down the melty ooey gooey pictuers and was like Ooooh MMMMMMMMM! Looks so delicious! This looks terrific! I am going to try it with gorgonzola. Beautiful picture tutorial. Thank you. That bread sounds like a perfect pair! 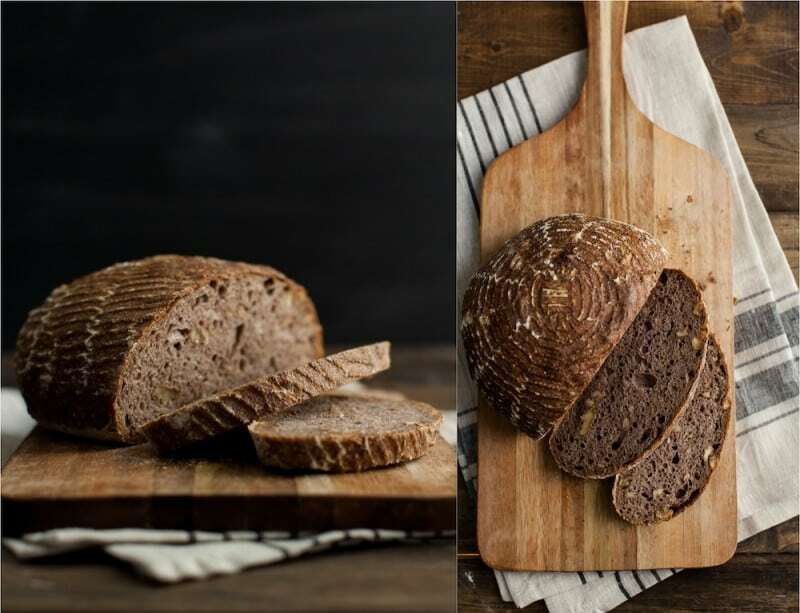 I used walnut/whole wheat but I’m thinking I’ll have to find a bread like yours to try! I just cruised from picture to picture and then this one jumped off the screen at me cause it just looked so yummy. 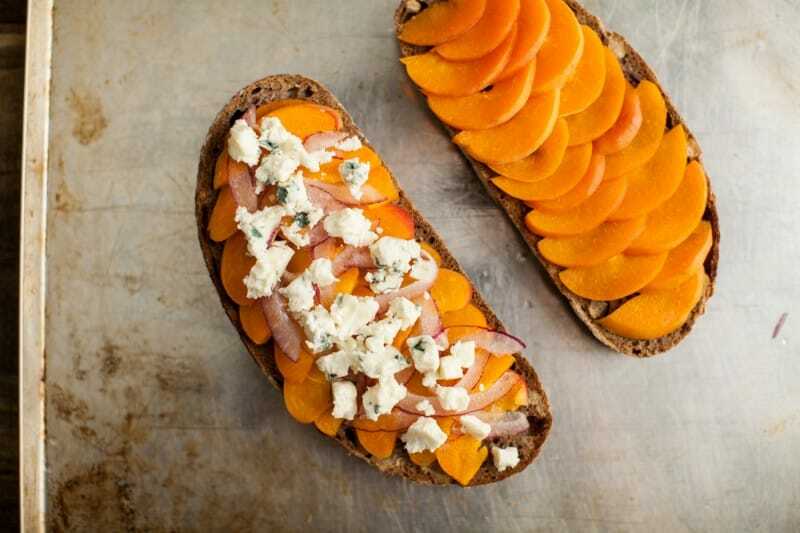 Apricots, Blue Cheese and Honey! I’m heading to the kitchen right now to try this out.